HC-02 Bluetooth serial communication module is based on the Bluetooth V2.0 Bluetooth protocol data transmission module, high stability, ultra low power consumption, industrial grade Bluetooth data transmission module. If you need to use iphone or ipad to control your arduino project, hc-02 4.0 ble slave module with 6pin baseboard may be a good choice.Fully compatible with ios7.0 or later.Also compatible with Android 4.3 or later. If the version of the Android os is less than 4.3. it is not compatible. This module supports bluetooth 4.0 ble mode and bluetooth 2.0 mode. If you are not so familiar with the Bluetooth, you can get more info about blutooth from here. Core module uses HC-08, leads from the module interface includes VCC, GND, TXD, RXD, LED status output pin. The interface level 3.3V, can be directly connected the various SCM (51, AVR, PIC, ARM, MSP430, etc. 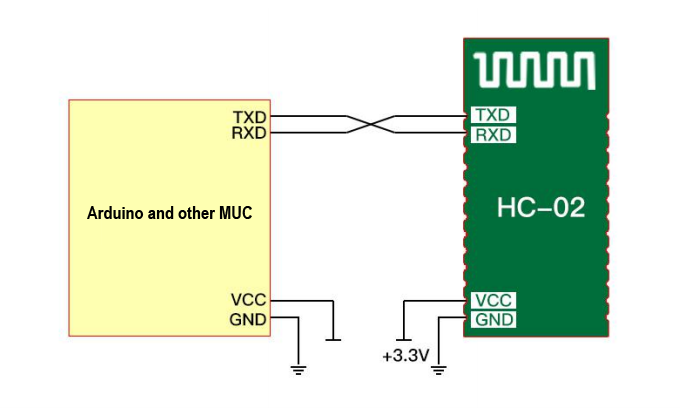 ), the 5V MCU also can be connected directly. Open to the effective distance of 10 meters, over 10 meters is also possible, but not of this the quality of the connection of the distance do to ensure. After the pair when full-duplex serial port to use, do not need to know anything about the Bluetooth protocol, but only supports 8 data bits, 1 stop bit, no parity communication format, which is the most commonly used communication format does not support other formats . 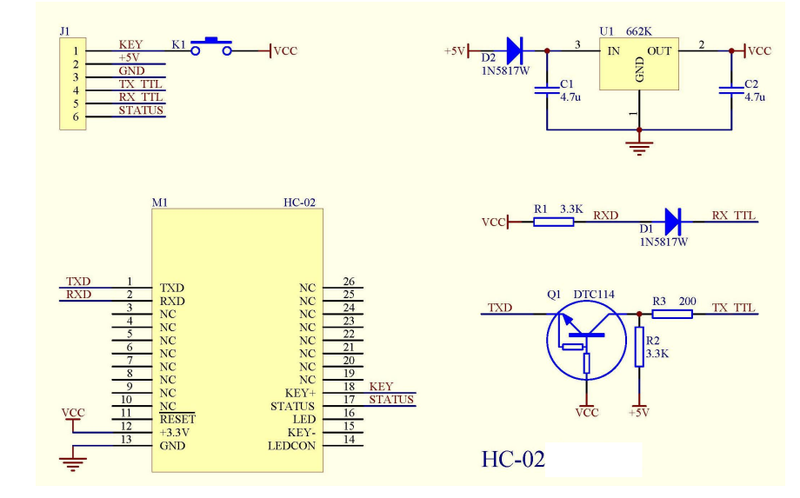 3 Ground Ground pin of module, connect to system ground. 4 TX – Transmitter Transmits Serial Data. Everything received via Bluetooth will be given out by this pin as serial data. 6 State The state pin is connected to on board LED, it can be used as a feedback to check if Bluetooth is working properly. The HC-02 is a very cool module which can add two-way (full-duplex) wireless functionality to your projects. You can use this module to communicate between two microcontrollers like Arduino or communicate with any device with Bluetooth functionality like a Phone or Laptop. There are many android applications that are already available which makes this process a lot easier.It’s also fully compatible with the iPhone. The module communicates with the help of USART at 9600 baud rate hence it is easy to interface with any microcontroller that supports USART. We can also configure the default values of the module by using the command mode. So if you looking for a Wireless module that could transfer data from your computer or mobile phone to microcontroller or vice versa then this module might be the right choice for you. However do not expect this module to transfer multimedia like photos or songs; you might have to look into the CSR8645 module for that. The HC-02 has two operating modes, one is the Data mode in which it can send and receive data from other Bluetooth devices and the other is the AT Command mode where the default device settings can be changed. We can operate the device in either of these two modes by using the key pin as explained in the pin description. During power up the key pin can be grounded to enter into Command mode, if left free it will by default enter into the data mode. 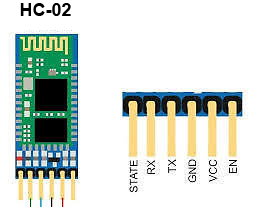 As soon as the module is powered you should be able to discover the Bluetooth device as “HC-02” then connect with it using the default password 1234 and start communicating with it. HC-06 is the host, HC-02 is slave, the matching code is consistent (the default is 1234), the baud rate is the same, then power on can be automatically connected. After the first connection, the HC-06 host will automatically match the matching objects. If you want to connect to other modules, you must first remove the pairing memory of the HC-06 host. There is no matching memory from the slave. HC-02 can be connected to Android mobile via Bluetooth, and Android can use Android serial assistant software. HC-02 can be connected to iPhone 4S and later version iPhone . Communication test needs to download and install BLE serial assistant software. HC-02 can connect to a computer via the HC-06-USB Bluetooth virtual serial port. HC-02 can connect to the computer’s Bluetooth device to communicate. needn’t pair. The interval of command is about 1 second. At this time the Bluetooth name is changed to “osoyoo”. More info about the AT Command please check this link.